With the race less than a week out, we are officially in our taper. We’ve got 3 more runs planned before race day, none of which are going above a 5k. Though I think we left a little bit on the table this training session, I do feel a little bit better about how we prepared going into this race as compared to last years training block. Hopefully our work will give decent results, as long as the weather holds out! Not trying to look past the race per-se, but in order to challenge me and motivate me more, our trainer Carley offered up an interesting proposition last Saturday. He wants to see better progress on my weight-goal, and offered to buy me dinner and drinks at the restaurant of my choosing. The condition though, is that I need to lose 20lbs in 8 weeks. This is a pretty lofty goal, and one that realistically is a little bit drastic, but certainly a challenge. So, once I agreed to the terms, I got on the scale and weighed in at 199.2. Eight weeks later, I need to be at 179.2. 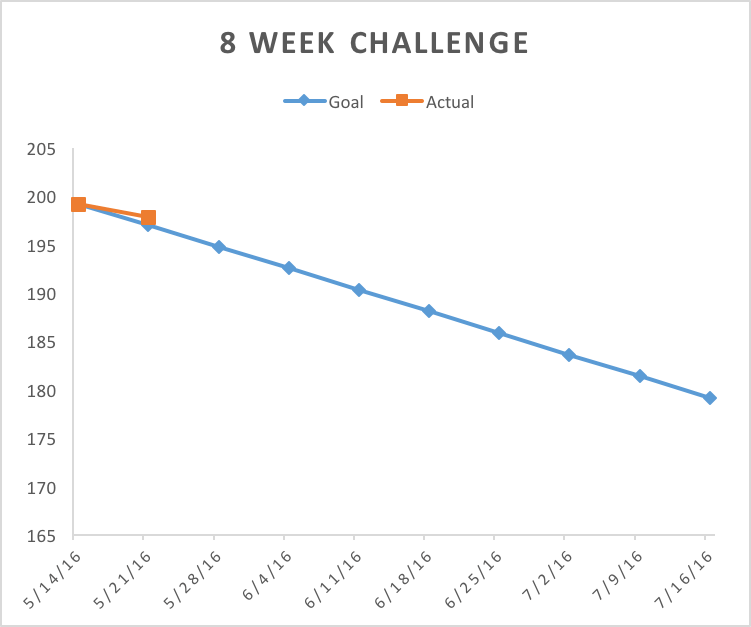 Week one’s weigh-in was a little behind schedule, being 197.8 instead of 196.9. I will need to work hard to make up the difference, but I have to say, having a weight goal and timeline has gotten me eating and working out harder almost immediately. This is a double benefit, getting my eating in check before the race too. Though I definitely do not recommend a weight goal of over 2lbs a week, as I don’t think it is realistic or sustainable, I think the goal of kick starting my eating habits will help a lot, even if I come up short in the end. Should be interesting!